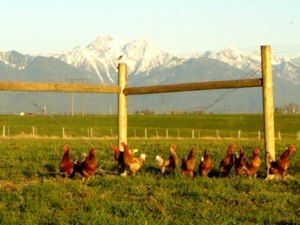 Mission Mountain Organic Eggs is situated in the heart of the Mission Valley of Montana, where John and Crystal Walkup's chickens roam freely on a massive amount of pastured ground beneath the Mission Mountains of Northwest Montana. This family run business pays close attention to the healthiest farming practices that they can possibly use - practices that go well above and beyond the standard certified organic requirements. Their chickens have clover and grass pastures that surround their barns that supply the eggs with added vitamins and Omega-3s. The chickens are fed a GREEN diet of green barley sprouts that are grown weekly for them to graze on daily. They use NO SOY or CORN products in their feed; instead rations are based on barley, pea, wheat and other greens. Mission Mountain Organic Eggs are cleaned through a hot water spray with absolutely no use of harmful soaps or detergents. The water is pure from aquifers fed by fresh water springs of the Mission Mountains - the same untreated water that the Walkups' and the chickens drink every day. The incredible passion and attention to detail in their honest farming practices definitely shows in their product. Healthy eggs should have yolks as bright as the sun and with one crack of these eggs you will see for yourself what genuinely healthy eggs look like.